After Hurricane Katrina devastated New Orleans, Mayor Ray Nagin said that the storm was divine punishment for "being in Iraq under false pretenses." Not only was a Liberal deity taking a position on WMDs and punishing George W. Bush by evicting a lot of black people from their homes; but the Democratic divinity was paradoxically also committed to progressive housing policies. "This city will be a majority-African American city. It's the way God wants it to be," Nagin promised. Bush is out of office. America is no longer in Iraq. And Democrats have been forced to search for new theological explanations for hurricanes, typhoons and volcanoes. In response to the devastation of Typhoon Haiyan; the green prophets of the left are prophesying that their liberal deity is angry over capitalism and industrialization. "Whenever Mother Nature wants to send an urgent message to humankind, it sends it via the Philippines. This year the messenger was Haiyan," The Nation wrote. The message was apparently that Mother Nature, not to be confused with the nice elderly lady who runs a blog about alternative medicines, really hates prefabricated housing. "That it was climate change creating the super typhoons that were taking weird directions was a message from Nature not just to Filipinos but to the whole world," The left-wing magazine claimed. For those infidels questioning whether Nature (capital N) was really speaking through a struggling lefty publication begging readers for money to pay its postal bills, its expert on typhoon theology had an answer. "Is it a coincidence, ask some people who are not exactly religious, that both Pablo and Yolanda arrived at the time of the global climate negotiations?" It is of course the very definition of religious faith to assume that a bearded woman in the sky is sending storms to threaten global climate negotiators (while missing them by two hemispheres and 6,000 miles). A more cynical person might suspect that climate negotiations are arranged around storm season for maximum effect. The Nation, which regularly condemns "Bible Thumping", had switched over to "Whole-Earth-Catalog Thumping"; building a religion around a Mother Nature who communicated her wishes through hurricanes and bankrupt liberal magazines. Pacific Islanders used to believe that volcanic eruptions were angry notes from their volcano gods. The Yaohnanen tribe in Vanuatu on contact with civilization modernized their beliefs, and after encountering a younger Prince Philip decided that he had come from the volcano and that they ought to worship him. And so the Prince Philip Movement was born. The islanders are modest in their requests of their god. "If he can't come perhaps he could send us something," the Yaohnanen Chief suggested, "a Land Rover, bags of rice or a little money." The Philippians may seem absurd, but their religion actually took a step forward from worshiping a volcano, which did nothing constructive and just destroyed things leaving the tribesmen to wonder whether the volcano was angry at their unjustified presence in Iraq or the waste carbon emitted by their cooking fires, to worshiping the Duke of Edinburgh, who can do constructive things like send them autographed photos. And perhaps one day a Land Rover. While the savage tribesmen were approaching the margins of civilization; Prince Philip's son was reverting to savagery and blaming everything wrong with the world, from local weather to the Syrian Civil War, on the great volcano god of Global Warming. After some winter storms, Prince Charles announced that, "severe weather conditions in our country are, I have no doubt, the consequences of man-kind's arrogant disregard of the delicate balance of nature." It was the sort of statement that would have been commonplace a century ago. The only thing missing was that "Nature" had replaced "God". The Yaohnanen tribe had moved on from worshiping a volcano god only capable of destruction; but the son of the living god they worshiped seemed eager to find a volcano god to worship. The savages were trying to become civilized, while civilized men were trying to become savages. At the Washington Post, the Rev. Dr. Susan Brooks Thistlethwaite, a former president of the Chicago Theological Seminary and a senior fellow at the Center for American Progress, gathered the tattered remains of her religion around herself and argued that Typhoon Haiyan was caused by human sin and needed to be atoned for by "confessing" that human beings cause typhoons. But then Thistlethwaite, displaying less faith in whatever god she believed in than Ray Nagin had in his Chocolate City divinity and The Nation in its typhoon-hurling Mother Nature, added that "These “superstorms” aren’t an “act of God,” but an act of willful disregard for God’s creation." That is to say, God is dead. Instead Republicans must confess to the liberal theologians who speak for the superstorms, that they were the ones who made the winds blow. And if they don't, then the speakers-to-superstorms will also hold them responsible for the next hurricane. What miracle is the Rev. Dr. Thistlethwaite's faith in superstorms founded on? Like the storms themselves, it's a bit circular. "The fact that we are having to invent new language to describe such massively destructive storms, like “Super Typhoon Haiyan” or “Superstorm Sandy” suggests we need to take a different look at such violent storms today and theologically assess the human responsibility for them." Using the Rev. Dr. Thistlethwaite's reasoning, the fact that we have a word for Superman suggests that we need to seriously investigate whether there are superhuman beings among us who can leap tall buildings in a single bound. But worshipers of the liberal God of Global Warming who hates the War in Iraq, white people living in New Orleans and carbon have a looser relationship with facts than Pacific Islander tribes. The term Superstorm isn't new. And neither are superstorms. In a listing of storms from 1932 onward, the first one shows up in 1940. Back at the UN Climate Change summit, which apparently incites Mother Nature to spout off typhoons like soda bubbles, the representative for the Philippines, Naderev "Yeb" Sano, threw a tantrum and demanded that Global Warming skeptics visit the islands to see the devastation. Then he announced that he was going on a hunger strike until something meaningful was done. Before Christianity and Islam, people in the Philippines believed that storms were brought by Saraganka Bagyo, the God of Storms, or Galurâ, a giant eagle who brings storms. Another story has it that they originated from a dispute between the descendants of the sea god and the sky god. Now Carbon has become the new Storm God, bringing bad weather because people won't do anything meaningful, like cripple their economies and destroy their standards of living to appease him. Sano, like Prince Charles and Ray Nagin, is reverting to a paganism buttressed by a science so bad that it is indistinguishable from superstition and magical thinking. too much time watching the Weather Channel, there is no actual pattern of increased storm activity. Nor is Mother Nature targeting UN climate negotiations with typhoons. The only pattern here is the one that a liberal religion that believes in little except human evil assigns to storm patterns. If the God of Global Warming worshiped by The Nation and the Rev. Dr. Thistlethwaite seems senselessly malicious, it is because it exists in their minds as a reflection of human evil. The left proclaimed the death of God only to find themselves in need of some entity to inflict ruthless punishment on those who did not believe in their left-handed path; which in the absence of the Gulags they were no longer able to do. Liberalism in act of idolatry built the God of Global Warming in its own image. Like liberals, their deity can destroy, but not create. beliefs while carrying out brutal atrocities in the name of the left's favorite political causes. With a moral logic as flawed as that of its worshipers, it is a deity that kills people in the Philippines for the carbon crimes of Americans and kills people in New Orleans because Bush bombed Iraq. Science only truly began to take off when scientists stopped trying to base it around their preconceived worldviews of how things should be, but began to actually draw conclusions from the data, instead of fitting the data into their conclusions. The human race did not suddenly become much smarter in the last few centuries. Instead our greatest minds learned a little humility and began getting out of the way of the data. Instead of trying to force reality to conform to their philosophy, they experimented with building a philosophy around reality. The left has killed reality-based science, along with so many other human accomplishments. Global Warming is the worship of the left. It elevates its petty biases against industry and the middle class to the status of a religion. It insists on their right to act as the mediators between individuals and the economy or else the God of Global Warming will unleash her superstorms on the bourgeois infidels. What a brilliant original thinker. Genius level. Using the term "Mother" Nature in the first place is misleading, not to mention insulting to most mothers. If my mother was regularly trying to kill me, and my survival depended on a combination of resourceful ingenuity and luck, I'd get as far away from her as I could and change my name so she couldn't find me. To be a true Liberal (or of any Group), the appropriate dogma must be believed and honored, without question. Any departure from the "straight and narrow" line can't be tolerated. Supernatural entities are necessary, in all cases, for they can justify anything; therefore all unquestioned things are permissible, provided they are approved by the "anointed one". "Nature" as god works. Religions can't allow questioning authority or current dogma, so they are always dangerous and usually violent. Present company excluded, of course. 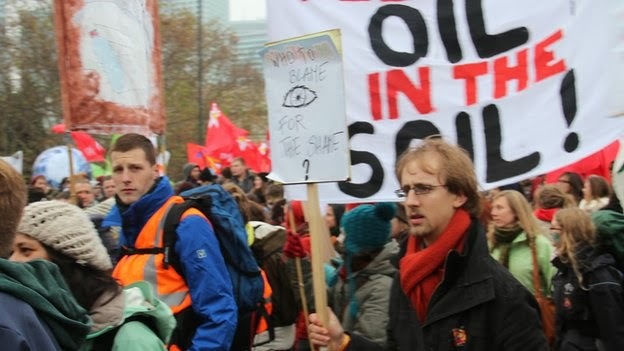 The real story is told in the three words on the sign in the picture "climate justice now". A classic example of using words to befuddle. They don't want climate justice they want free stuff. They want socialism. They want what you got and they will say anything, tell any lie, pull any subterfuge to get it. Anytime you see the phrase "social justice" you are looking at a committed socialist who wants "free stuff". Great work of knocking down strawmen, Daniel. 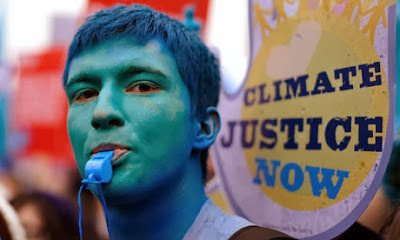 Why contend with such pesky things as scientific papers, when instead caricaturing climate change advocates by using the deluded ramblings of the leftist media and "progressive" hippies and then triumphantly "exposing" their hysteria is so much easier. What you see above is the "feelies" of the Left, being ridiculed by the "feelies" of the right. Facts? Research? Paleeeeease... Are you trying to insult me? Me and my dying grandmother? Environmentalism is a form of paganism that worships "nature" instead of God. Because they have written God out of their belief system, environmentalists must compensate in two ways; first, they must make themselves all-knowing and all-powerful, and second, they must invent their own form of salvation. Environmental religion is nothing new. In the 1970's, all plant life on Earth was going to be destroyed by acid rain unless we enacted laws to restrict industry. Later, the Earth was going to melt down to its core unless we shut down the nuclear power plants. Then we were all going to perish from the ozone hole. Still later, after we banned aerosol propellants, plastic shopping bags and incandescent light bulbs were going bring on extinction-level events. Now, global warming will cause the seas to rise and the ground to shift. The environmentalists first concoct an apocalypse scenario and then try to convince us that only they can prevent it. The "solution" always comes in the form of suppressing individual liberties. Environmentalism is not about protecting the Earth; it is about the environmentalists trying to build a Tower of Babel and to make a name for themselves in their battle against God. The regularity of snow storms coinciding with global warming protests suggests "intelligent humor." Thanks for a truthful, insightful article. Very timely! Is it a coincidence that in Europe at the climate summit 2 years ago on global warming had the biggest snow storm in years enough to strand Nancy Pelosi there and all her "believers"? Did we already forget about that? Humanity has always found a need to blame others, or something, for its failings. The best response for this need and for human failings is found in the Bible, the Word, or the explanation for everything. But man, some men, have always found a reason to reject God. Throughout human history, the reality is that fallen man has looked far and wide to explain the reality of everything and come up with the most bizarre explanations to try to come to a conclusion of why things are. I have never found a more compelling explanation of why things are than what is written in the Bible. The late Michael Crichton pointed this out nicely in a speech nearly 10 years ago.A pdf archived transcript of his speech on this is available here. Crichton was a very sharp fellow, and his points are almost always spot-on. Excellent piece. 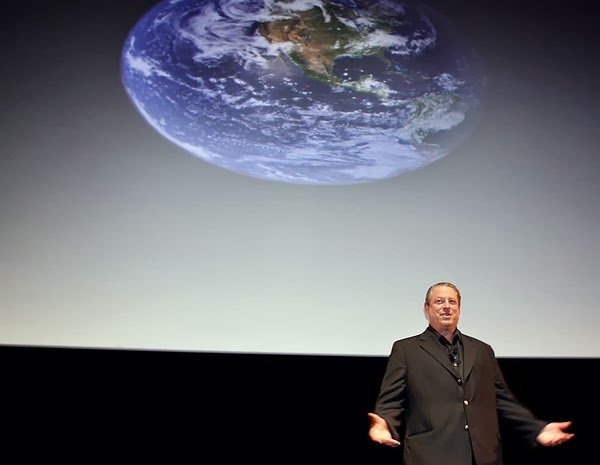 Global warming hysteria, and contemporary "environmentalism" in general, is a result of the confluence of several strains of modern culture. Volcano god paganism is one. Marxism, of course, is another. The dark views of Calvinism, the religion of the New England Puritans, from whom the progressive movement descended, is another. Calvinists believe that mankind is doomed to sin in this life and can only be redeemed by complete denial of hope, pleasure, achievement or satisfaction in this life. New Age Gaia worship is another, which is religious and philosophical ignorance, mixed with the pagan urges and unfettered narcissism that naturally arise among the spiritually and philosophically immature. Add political opportunism and the need for many humans to have a sin/apocalyptic retribution myth of some kind, and you have a perfect superstorm of collective folly. I'm all for Climate Justice Now! I want the same balmy climate as Bali here in the North East! Isn't it ironic that the same people that cry about how "the planet" is telling us to stop burning fossil fuels by smiting us with "extreme weather events", will usually say that it's unscientific to claim that, for instance, a particular natural disaster is a punishment by a deity for some "sin"? Such hypocrisy!